Hyundai I20 WRC - D. SORDO. Référence RAM677. Rallye du Portugal 2018. Hyundai I20 WRC - Th. Référence RAM673. Rallye de Suède 2018. HYUNDAI i20 WRC Rallye Monte Carlo 2018 #5 Neuville Shell. Alles rund um Motorsport und Modellautos. Ihr kompetenter Fachhändler rund ums Hobby Modellautos. Modellautos - Raritäten / Schnäppchen / Umbauten. IXO TRANSKIT. 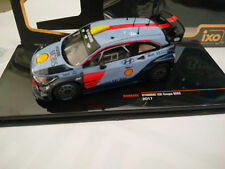 HYUNDAI i20 WRC - 1/43. RALLYE CATALUNYA 2017. Only opened for the photo. IXO TRANSKIT. HYUNDAI i20 WRC - 1/43. RALLYE MONTECARLO 2017. Only opened for the photo. Driver: Neuville. Model: Hyundai i20 WRC. Event:Winner R.Portugal 2018. 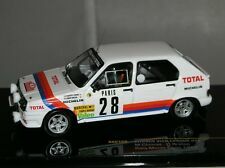 First 1/43 model in the Hyundai winner/podium (orange front wheels). Length: 10 cm. 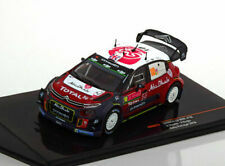 HYUNDAI i20 WRC - 1/43. IXO RAM 645 B. RALLYE CATALUNYA 2017. Only opened for the photo. THIERRY NEUVILLE / NICOLAS GILSOUL. 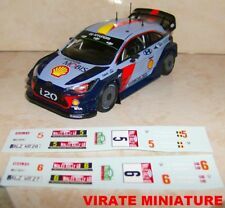 HYUNDAI i20 WRC - 1/43. IXO RAM 623. Only opened for the photo. 1º RALLYE CERDEÑA 2016. Tipo: i20 WRC. Ixo Rally Hyundai. Fabricante: Ixo. No.16, Rally Portugal 2018. Rally 1:43. Rally 1:18. Factura con IVA. Artículos bien protegidos y embalados. Hyundai i20 WRC. Thierry Neuville - Nicolas Gilsoul. Ganadores del Rally de Portugal 2018. Edición especial con las llantas versión podio. Typ: i20 WRC. Ixo Rally Hyundai. Type: i20 WRC. Manufacturer: Ixo. Constructeur: Ixo. No.16, Rally Portugal 2018. Rally 1:43. Rally 1:18. Hyundai I20 WRC - Th. Référence RAM663. Rallye Monte Carlo 2018. RAM669 Hyundai i20 R5 Rally Monte Carlo 2018 Sarrazin. 1/43 Ixo diecast. IXO RAM645 Hyundai i20 Coupe WRC #5 'Hyundai Motorsport'. Winner Tour de Corse 2017 - Thierry Neuville. Our modern Formula One range features all GP racing from the year 2000 onwards, Classic F1. The sportscar range is one of the largest in the country featured modern and classic racers. RAM663 Hyundai i20WRC Rally Monte Carlo 2018 Thierry Neuville. 1/43 Ixo diecast. IXO RAM646 Hyundai i20 Coupe WRC #6 or #4 'Hyundai Motorsport'. Tour de Corse Rally 2017. 1/43 Scale model approx. 10cm in length. Over the next 7 years, we continued to develop our ranges and exhibited at key Motorsport Events, F1. IXO L12C02 Hyundai i20 WRC 'Hyundai Motorsport' Sweden Rally 2015. Thierry Neuville/Nicolas Gilsoul. Our modern Formula One range features all GP racing from the year 2000 onwards, Classic F1. The sportscar range is one of the largest in the country featured modern and classic racers. Here I have listed beautiful and rare model for sale. I have added night lamp, to make it even more realistic. Hyundai I20 WRC - Th. Neuville / A. Mikkelsen. Référence RAM660. Rallye de Monza 2017. Hyundai I20 Wrc #5 Winner Rally Sweden 2018 T.Neuville N.Gilsoul 2 Tone Blue IXO 1:43 RAM673. IXO RAM663 Hyundai i20 Coupe WRC #5 'Hyundai Motorsport'. Monte Carlo Rally 2018 - Thierry Neuville/Nicolas Gilsoul. 1/43 Scale model approx. 10cm in length. Over the next 7 years, we continued to develop our ranges and exhibited at key Motorsport Events, F1. IXO DC15-SA-020 Hyundai i20 WRC 'Hyundai Motorsport' Sardegna Rally 2015. Hayden Paddon/John Kennard. 1/43 Scale Model approx. 10cm in length. Over the next 7 years, we continued to develop our ranges and exhibited at key Motorsport Events, F1. Fahrer: Dani Sordo / Carlos Del Barrio. Dani Sordo / Carlos Del Barrio - # 16. Fahrzeug: Hyundai i20 Coupe WRC. Hyundai i20 WRC - Rallye Portugal 2018. IXO RAM 677. 1:43 - IXO RAM 677. Veranstaltung: Rallye Portugal 2018. IXO MNP-RP2018. 1:43 - IXO MNP-RP2018. Fahrer: Thierry Neuville / Nicolas Gilsoul. Fahrzeug: Hyundai i20 Coupe WRC. Thierry Neuville / Nicolas Gilsoul - # 5. Hyundai i20 WRC - Rallye Portugal 2018. Material: Die Cast - IXO Basis. 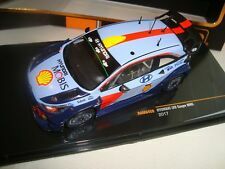 HYUNDAI i20 WRC - 1/43. IXO RAM 645 C. RALLYE GALES 2017. Only opened for the photo. Hyundai Accent WRC - Prager Rallyesprint 2003. Veranstaltung: Prager Rallyesprint 2003. Fahrer: Josef Beres / Petr Stary. Josef Beres / Petr Stary - # 7. Serie: Umbau Collection - IXO Basis. 1:43 - IXO - CZ43-2003-PR-007. N°7 PILOTEE PAR THIERRY NEUVILLE. HYUNDAI I20 WRC. RALLYE DE SUEDE 2015. DANS UNE COLLECTION DE RALLYE. VERSION "HYUNDAI MOTORSPORT". UNE SUPERBE PIECE. NEUVE EN BOITE. El coche mostrado es un Hyundai i20 R5 con dorsal 76 y pilotado por S. Sarrazin en el Rally de Monte Carlo del 2018. REST OF WORLD. Fahrer: Bryan Bouffier / Xavier Panseri. Bryan Bouffier / Xavier Panseri - # 1. Hyundai i20 WRC - Rallye Antibes 2014. Veranstaltung: Rallye Antibes 2014. Fahrzeug: Hyundai i20 WRC. IXO RAM 586. IXO - 1:43. Alles rund um Motorsport und Modellautos. Ihr kompetenter Fachhändler rund ums Hobby Modellautos. Modellautos - Raritäten / Schnäppchen / Umbauten. Belgien, Dänemark, Frankreich, Großbritannien GB, Irland, Italien, Luxemburg, Niederlande, Polen, Portugal, Schweden, Spanien. HYUNDAI I20 R5. RALLYE MONTE CARLO 2018. WINNER RALLY TOUR DE CORSE 2017 NEW RAM645. 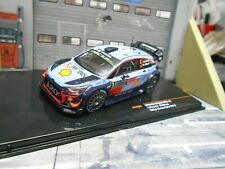 IXO 1/43 T. NEUVILLE #5 HYUNDAI i20 COUPE WRC. WAIT FOR SENDING THE BILL. VALIDO SOLO PER L'ITALIA! CONTATTATEMI PER QUALSIASI RICHIESTA. Veranstaltung:Prager Rallyesprint 2003. Fahrzeug: Hyundai Accent WRC. Fahrer:Josef Beres / Petr Stary. Maßstab: 1:43 – Limited Edition 1/100 – IXO Basis. Ixo 1/43 Hyundai Accent WRC de A.Schwarz et M.Hiemer au Rallye Monte Carlo 2003. Comme neuve en boîte. D'autre photo sur demande. Fahrer: Hayden Paddon / John Kennard. Paddon / Kennard. Veranstaltung: Rallye Sardinien 2015. Rallye Sardinien 2015 - 1:43. IXO DC15-SA-020. Fahrzeug: Hyundai i20 WRC. RAM673 Hyundai i20WRC Winner Rally Sweden 2018 Thierry Neuville. 1/43 Ixo diecast. IXO RAM624 Hyundai i20 WRC #20 'Hyundai Motorsport'. Hayden Paddon/J ohn Kennard. Our modern Formula One range features all GP racing from the year 2000 onwards, Classic F1. The sportscar range is one of the largest in the country featured modern and classic racers. PORTUGAL (NOT ISLANDS). REST COUNTRYS NOT FREE. ONLY UE COUNTRYS (NOT ISLANDS). GASTOS DE MANIPULACIÓN Y ENVÍO PARA ESPAÑA. BUS líneas 20,34,62. AUSTRIA,BENELUX,FRANCE,GERMANY.